An online presence. We all have one these days don’t we? But do we all realise just how important it can be for our careers? Not always. Over recent years, there’s been a definite shift from traditional forms of career development and opportunity enhancement to more modern, digitalised versions and it’s worth taking it all rather seriously. Whatever career path you may choose in the beauty industry, you’ll get closer to your goals (and a lot quicker) if you develop a personal brand and care for it regularly by using your online presence. Personal branding is about communicating your name, unique style, image, story, skills, strengths and your personality. This will set you apart from anyone else in the industry. After all there’s nothing more unique or authentic than you and your story. The most popular example of successful personal branding at the moment is Kim Kardashian. Love her or hate her, the girl has got herself out there and become one of the biggest hits in beauty ever and social media has been one of the most powerful tools that she used to build her brand. But Kim is just one exceptional example (you have to be exceptional to get 30m Instagram followers). There are so many other excellent examples of beauty experts who created powerful and authentic personal brands, like Lisa Eldridge a famous makeup artist, Tanya Burr a British youtuber beauty success who created her own cosmetic brand Tanya Burr Cosmetics or Teni Panosian who describes herself as an extremely well-informed consumer who’s been doing a ton of research in beauty over the last few years. These ladies sure know what they are doing when it comes to personal branding. They have built a strong online presence with social media and their websites and are now an authority and industry leaders. Do You Really Need to Care for Your Online Presence? The short answer is YES! It’s a must these days. It doesn’t matter what career you choose: whether you are looking for clients as a makeup artist, for partnerships with big cosmetic brands or a job in a beauty salon. People who have never heard of you before will look for you online and the first thing they’ll find is your website and your social media presence. There are a few good reasons to care for your online presence if you want to rock the beauty world. 1- It will help you to grow your online brand and it will help you to establish authority. 2- Industry leaders and influencers are on social media too! Pretty much every internship and job will be in the social stratosphere at some point or another, so you need to be ready to grab the opportunity when it comes up. 3- Connections and networking. You’ll get the chance to connect with people you may never get the chance to meet in real life. When someone checks your social profile, they’ll soon get a mental image all about you, so make sure that you’re the one who paints the right picture for them. 4- You’ll be behind your peers if you don’t. Social medial will give you the opportunity to build your online presence and when the job opportunity or the client comes knocking, you’ve got a whole lot of material to back you up when you say that you love the beauty industry. Having a strong online presence will open the door to a world of opportunities. From speeches, advertisements, partnerships and so much more. Where should you build your online presence? It can be a bit overwhelming deciding where to go social as there’s no lack of choice these days when it comes to online presence. You don’t really need to be on all social media platforms available. You just need to choose the ones that better serves your brand. Instagram for example, is perfect to share your image quite literally. But if you really have more to say and share, you should start yourself a beauty blog (we recommend wordpress.com and have added a link for you). It’s also a great platform to showcase your work – whether it’s writing, photography or something more creative, treat it like your own mini portfolio. I’ve made the choice easy for you. In this image, we cover the social media basics to help you decide which social media platform makes more sense for you and your brand. Let’s use a Revlon lipstick as an example*. What’s right for you and your image may be completely different to the next persons. Be original and authentic. Originality and authenticity is important here and will set you aside from anyone else. Being able to harness your online presence is a good thing, but only if you’re promoting the right brand image for you. 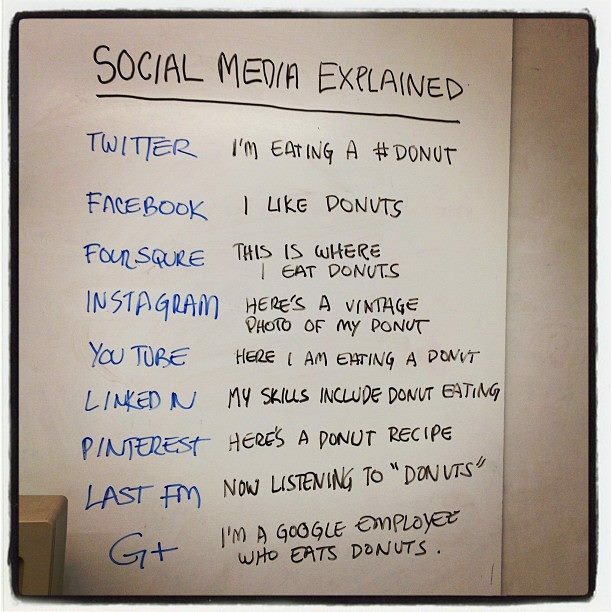 *Image inspired by a this brilliant donut example. Grace Olivia is a British based fashion blogger and freelance writer. Having worked in PR with a number of international clients, including Wildfox Couture, Feel Unique and Clarins, Grace took her passion for writing to the next level by becoming freelance full time. She now composes copy for business both small and multinational, contributes articles to both online and print mediums and outsources blogging services. Her personal style blog, www.dorothyandolive.com, was shortlisted as one of the ‘Best New Fashion Blogs’ in 2014 by Cosmopolitan and regularly sees her working with the likes of Topshop, Warehouse, Look Fantastic and Daniel Wellington to name a few. Find @graceoliviap on Instagram and Twitter to stay up to date.